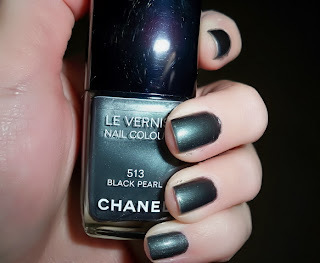 Do any of you own Black Pearl, or any other Chanel polish? Congratulations on your first Chanel polish! :D I like Lotus Rogue. Marie: Lotus Rogue, is that a red color? I love the names! I don't have any Chanel polishes but you're starting to make me question why! Love this color! Very Pretty! I might have to get this one too! :) Have fun today! Natasha: I feel the same way, except I stayed away because of the hefty price tag. I feel bad enough buying a nine dollar bottle of OPI. But 25 plus tax for Chanel? Crazy! I will say the quality is beautiful though and I love the color range. Hahaha, yup! I bought into the Chanel Black Pearl hype too. I like it, and I can see why others love it, but Pearl Drop is a lot more "me". I want to try Peche Nacree next! I love this color! So chic. Chloe: Pearl Drop looks very pretty too, it almost reminds me of NARS Albatross highlighter. Love it! That's such a pretty color and it has great shine. Did you use a top coat? BTW I love your blog and followed! I'm glad you bought it! You clearly really wanted it, and in those cases, it's better to just give in. It's a very pretty color btw! Alee: Yes, I used the Seche Vite top coat, which always makes my nails look super shiny. Thank you for following, I will check yours out! Marie: Thank you, I did want it so badly! I just need to stop buying so much nail polish. It's really addicting! Hazel: Thank you =) Yes, anything Chanel is an investment. I recently purchased (from the same collection) the Pearl Drop (white/cream color) and I like it - not totally in love - but I am holding out for the Chanel RIVA polish from resort... although, I need to justify spending the $$ on a nail polish (when it = a shirt at H&M)! Ella: I will be doing that tag tomorrow =) Thank you again for thinking of me.